Happy Birthday 500 Days Of Film! Celebrating Three Years Of 500 Days Of Film! On the 4th of May 2015 - exactly three years ago - I sat down where I am sitting today and made a list that would change my life. On that list were 400 movies. Most of these films had been released over the past five years (approximately 2010-2015) but some were older, beloved classics. Why did I do this? Well, after months of feeling disconnected from cinema, I decided to take control of my movie viewing. No more scrolling endlessly through titles only to pick something unsatisfying. No more shuffling through DVDs until my eyes blurred over. No. I wanted to get strategic with my film picks. Life was simply too short for bad movies and I knew that I was missing out on some real cinema gems. However, I also wanted to watch films from a broader range of genres. Not just horror and drama but world cinema, documentaries and independent films. I was determined but still a little worried that my resolve might weaken, that I might fall back into old, rather chaotic film watching habits. As a result, I decided to set myself a challenge - I would watch 500 movies in 500 days. Before I could change my mind, I announced my intention to friends and family (who no doubt thought I was crazy but were too kind to voice their concerns). There was no turning back as I started to watch the first film of my challenge: Paul Thomas Anderson’s Punch Drunk Love. Don’t ask me why I started with this film. I can't remember - perhaps it had been in the news. However, it was a movie that I had been wanting to watch for ages - and I absolutely loved it. Just like that I was hooked - this challenge was going to be a whole lot of fun. One of the first things I was asked when I began 500 Days Of Film was how did I create my list? Sadly, this process was not (at all) scientific. I simply went back five years and noted what my favourite movie critics had voted "film of the week" every week during that time. I then added some films that I really wanted to see again - some absolute classics. My initial list was longer than 400 films. However, I limited myself to that number because I wanted to add new films every week. I reasoned that, over 500 days, I would easily have 100 more films. Click Here To See My 500 Days Of Film List! The second question I was often asked was how do I watch my movies? At the beginning, I would watch my films in the evening - usually (because of the age of the movies) on DVD or via streaming services such as Amazon and Netflix (later branching out to Curzon At Home, BFI Player and Mubi). My challenge didn’t require me to watch a film every day without fail… I worried that would be too constricting (and that real life might get in the way). So, when I could, I would watch two or three films in a day in order to keep on top of my schedule. Meanwhile, I watched the latest releases at the cinema whenever I could. Don’t get me wrong, I’d be at my local multiplex (the wonderful Odeon Epsom) every day if I could. However, back at the start of my challenge, I had to watch my pennies. All that changed just under a year after I started 500 Days Of Film. Odeon launched its Limitless membership programme and I was one of its early adopters. I’ve recently renewed my subscription for the third time and I wouldn’t be without my card. For £17.99 per month (or £205 per year) I can watch as many movies as I like. And so (within reason) I do. It now makes financial sense for me to see a film in the cinema and this is by far my favourite way to watch any movie. As a result, in the months since the end of my 500 Days Of Film challenge (spoiler: I completed it!) I have started to watch far more new releases than older films. I do still have a list of must see classics and appreciate all movie recommendations. For example, I recently watched The Changeling and loved every minute! Indeed, one of the best things about creating the 500 Days Of Film challenge, has been the conversations I have had with people about movies. Everyone likes to talk about the films they love (and those they hate!). I suspected (correctly as it turned out) that I would often be asked about the movies I had watched. What were they about and who starred in them? Who were they directed by? Where they worth a viewing? Unfortunately, I have a terrible memory. Ask me now what movies I have seen in the past week and I’ll immediately go blank. I’ll have to really think hard to recall any of them. With that in mind, I decided to write about my film journey and created this website to collate all of my film lists and reviews. Reviewing films proved quite a challenge at first. Not the writing so much (I have been a writer and a journalist all my life) but having the confidence to publish my own opinions. Of course, life would be dull if we all held the same views but was I brave enough to go against the tide, to say when a film hadn’t worked for me? In the end, I decided that honesty was the best policy. That way I could never go wrong. I always try my best to explain why I haven’t enjoyed a movie and remain respectful of the enormous time and effort it takes to make even the smallest film. That’s not to say that I don’t still feel a jolt whenever a film director, editor, producer or actor comments on one of my reviews. I immediately have to re-read my article to ensure that I have expressed my feelings sensitively and appropriately. Social media has formed a key part of my journey through film. 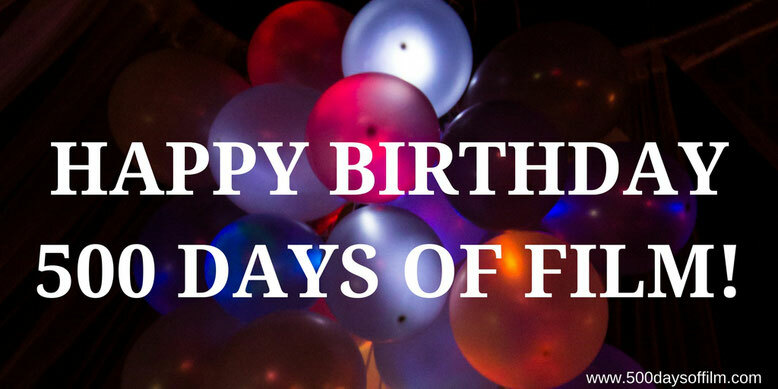 I joined Film Twitter (@500DaysOfFilm) and started to talk to other like-minded film fans about 500 Days Of Film and the movies I was watching. Interestingly, many of the people I communicated with on Twitter did not feel that 500 movies in 500 days was any big deal. I was also starting to feel a little guilty but for different reasons. I was just having too much fun - was this really a "challenge"? A few months into my film quest, I realised two things. One, people were missing some of my reviews and asking me to email them. Two, I wanted to take 500 Days Of Film a step further and start a film club in my local area. As a result, I started a weekly, subscription-based newsletter featuring film news and events, the UK box office top ten, my reviews of the week’s films, the latest cinema, dvd and streaming releases and a “film feature” article that would allow me to go into a topic in greater depth. I am so grateful for every single subscriber. I absolutely love creating this newsletter for you. Meanwhile, on 23rd September 2015, The 500 Film Club had its first screening. The film was Baltasar Kormákur's Everest starring Jason Clarke, Josh Brolin, Jake Gyllenhaal and Emily Watson (who was also in Punch Drunk Love!). While its numbers vary, The 500 Film Club is still going strong. It is always wonderful to meet up with the Club’s regular attendees and watch a movie that, perhaps, we wouldn’t ordinarily have chosen. Odeon Screen Unseen screenings have certainly helped on that score! As I approached the end of my challenge, in September 2016, I decided to treat myself by watching films from my favourite director - Steven Spielberg. My final film was my favourite movie of all time - Jaws. I was so pleased to have completed 500 Days Of Film. However, I was also really sad. What would I do without it? The only answer was to keep on going. And so I have! I haven’t focused on numbers so much but, every week, I watch at least five movies (often more) and write four film reviews plus a film feature. I love 500 Days Of Film. It really has changed my life. I’ve watched some incredible films, had some brilliant cinematic experiences (including film festivals and special movie events) and made some wonderful friends along the way. I would like to take this opportunity to thank everyone who has helped and supported me thus far. I really appreciate your time and film recommendations. However, I do miss the excitement of the challenge itself. Perhaps it’s time to set myself a new one - watch this space!